Well, it's happened again - you're in email jail, unable to send any new outgoing messages because your inbox is full, which means your entire workflow is going to be held up while you go and delete items to get back in the clear. It's not really the email messages that bulks up your inbox, it's all of those attachments - the Word files, Powerpoint presentations, and Excel spreadsheets that everyone in your office sends via email. 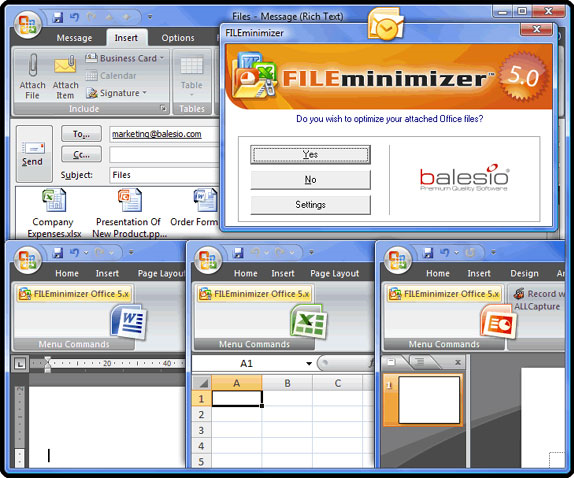 FILEminimizer is a must-buy for any Microsoft Office-based operation. 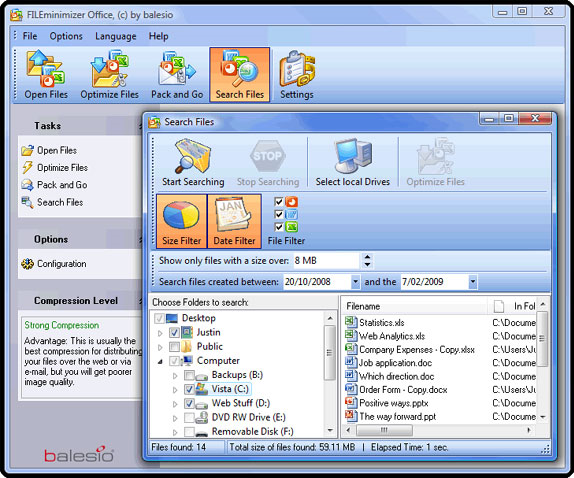 The software works with all Microsoft Office files, including the DOCX, XLSX and PPTX file format that debuted with Microsoft Office 2007. FILEminimizer even contains a handy search wizard that will scan your network for all Word, PowerPoint, and Excel files, and has an Outlook add-in that will automatically reduce / optimize your attachments before your email is sent! Reduce the size of Microsoft Office files by up to 98%! 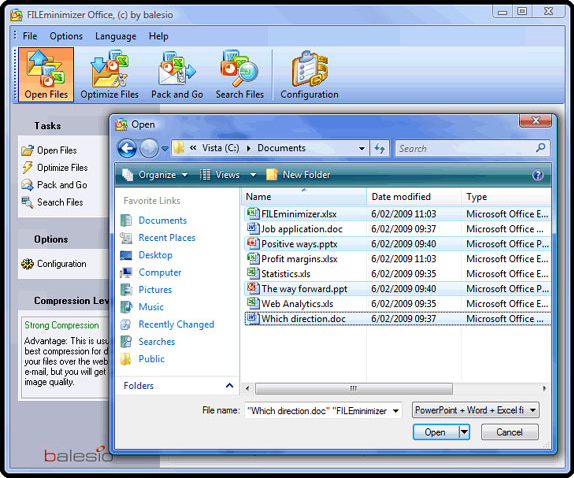 Compress Microsoft Office files without sacrificing the original file format or quality. Minimize network bandwidth usage due to large email attachments. Scan your network for all Microsoft Office files. Configure Outlook to automatically compress Microsoft Office attachments when sending emails. After you purchase FILEminimizer Office it may be used indefinitely. FILEminimizer Office is licensed per user, so if more people are going to use FILEminimizer Office you will need to purchase additional copies. I end the procedure but i receive a mail to click a link but it send my AGAIN to the registration form ho the software home page. Constantin Florea @Cla User, That is correct: you have to click that link in the receipt email. The link will direct you to the registration form where you need to register so you may receive the registration information. In caso di problemi, siamo qui per aiutarvi. Cla @Constantin Florea: thank you, i received (in a very late time ;) ) the mail with the code. Norman Breen Will it work on Microsoft Publisher? Nico Westerdale Great News! balesio AG has agreed to extend this deal for another day - Enjoy! Jack Fountain Does this version WATERMARK my files? No this version does not. Only the test version does this. Please use the license from the giveaway to activate the full version. Just a Guy What's up with the License Agreement? physical or environmental damage... "
Tom N Hello Lewis Everall! Are you going to make PDF minimizer or Suite package promo ? I'm very interesting. Optimize, Compress & Reduce your PDF, PowerPoint, Excel, Word and JPEGs!